I can't believe I'm wrapping up yet another remix series! I've styled my white skinny jeans 3 different ways for spring, and I'm wrapping it up with a little going out/date night look! I love a simple, loose tank for a night out because they're easy to dress up, and I just always feel best with a little breathing room. Normally white jeans wouldn't be my first choice for a going out look, but with black and red they make quite a statement! Here are all 3 looks! PS ~ I'm really considering not doing my monthly remix series anymore. These past few months I just haven't been feeling as inspired, and I almost feel like I'm limiting myself a bit. I don't know... Maybe if I take a break I'll be into it again. What are your thoughts? Is this something you really love seeing on here or is it just 'eh'? Or would you like an occasional remix post showing a few different ways I've worn a particular item over the course of normal blog posts?? You look perfect in all these outfits. Love your recap Jacy! The red and white is fab! I love the red and white! :) I understand how you feel about limiting yourself. There is nothing wrong with tweeking an idea or getting rid of it all together - just do what feels right for you :) I love all of your posts! You always have the cutest accessories!! 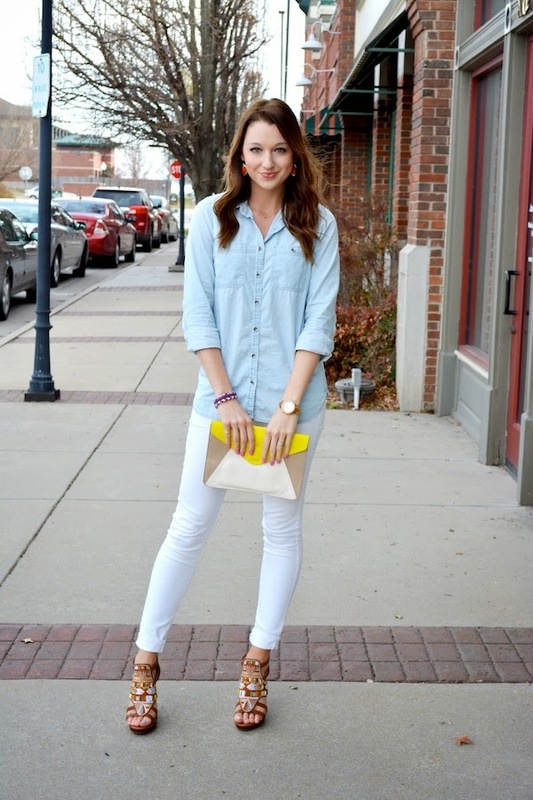 I can not get enough of my white jeans - I love all the ways you've styled yours! I say don't do a remix post because it feels like an obligation, do when you think "wow, I styled the heck out of this piece, and want everyone to know it." I love your orange top! Or is it red? I love the coral top and white trousers. Very vibrant and summery!! Love those pants! Perfect fit for you.